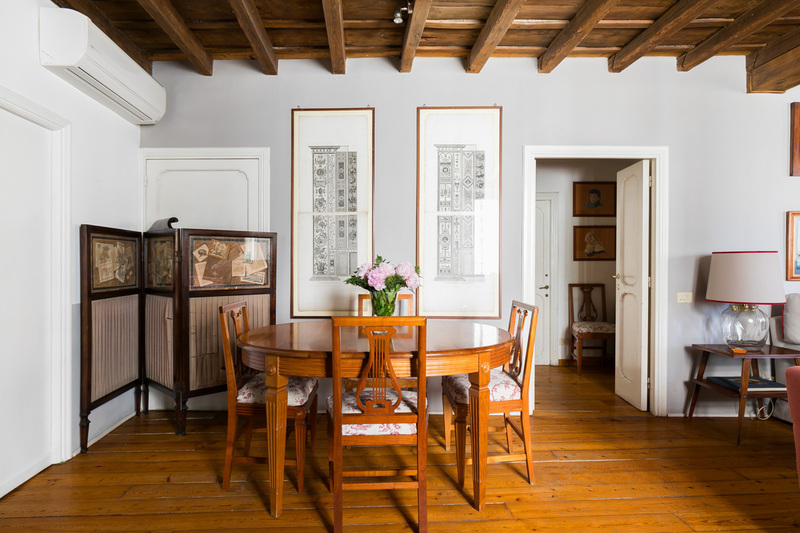 This penthouse offers a lovely classically decorated space to call your home in Rome. Fully air-conditioned, it sits on the third floor of an ancient building without a lift. You’ll find this spacious apartment both cozy and comfortable. 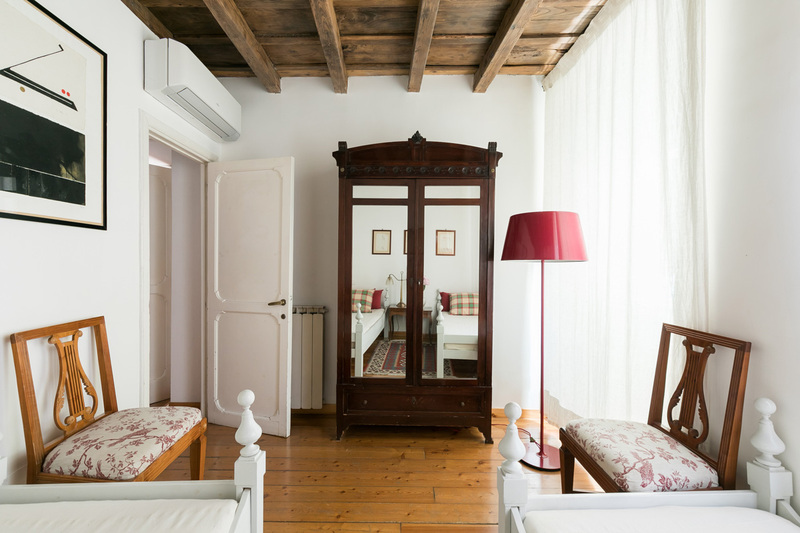 For example, its wooden floors and beams on the ceilings, add a comfortable feel. When you first step in, you’ll immediately find yourself in the lovely open concept living/dining room. Here there are two comfy sofas, two coffee tables, a colorful carpet, and a decorative fireplace. There is also a rich library and a nice wooden table which sits four people. You’ll also find WIFI connection, Sat TV, a DVD player and a Hi-Fi system. 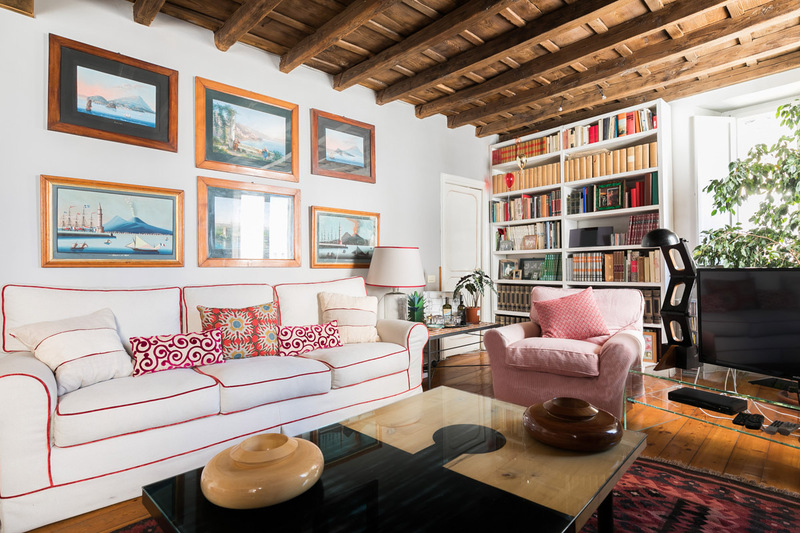 This room’s large windows allow plenty of light in and offer a wonderful view over Piazza Farnese. Adjacent to the living/dining room, there are two bedrooms. 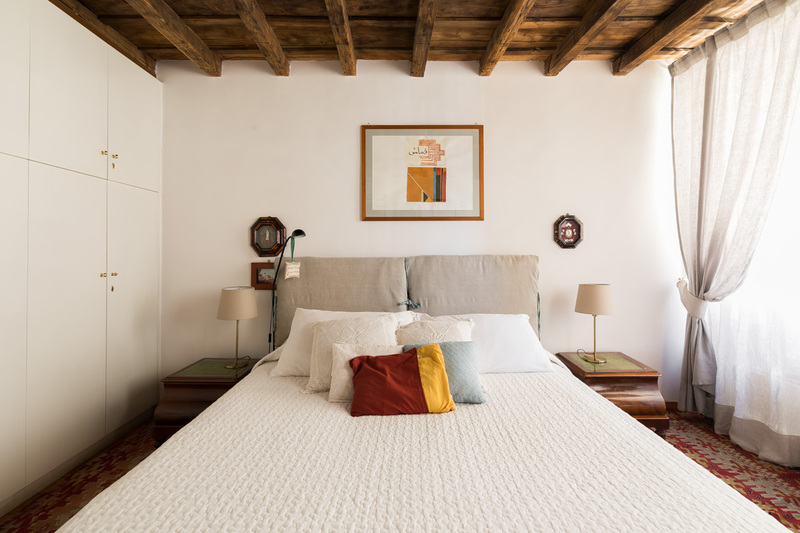 The first is elegantly furnished with a queen size bed, a chair, night tables, night lamps, and a console with wonderful framed artwork around it. There is also a spacious wall closet, a 3 drawer chest and a ceiling fan. The second bedroom is nice and luminous and offers two single beds, a night table and a night lamp. 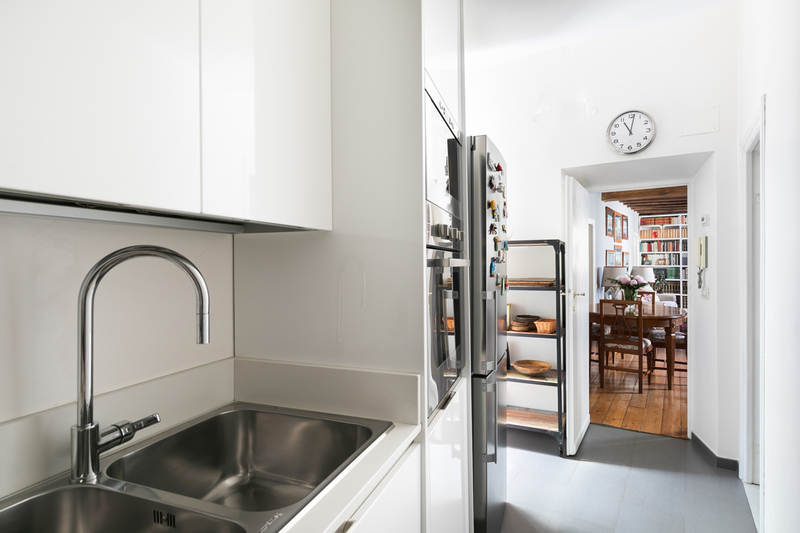 The kitchen is very well equipped with everything you need to cook up a meal at home. 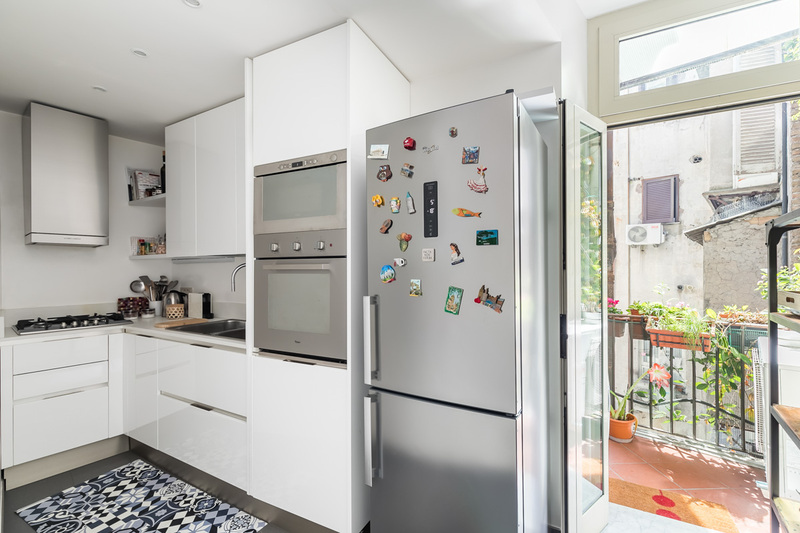 You will have access to a gas stove, an oven, a microwave, a refrigerator, a freezer, a dishwasher, as well as all of the necessary tableware and flatware. The washing machine is also in the kitchen. 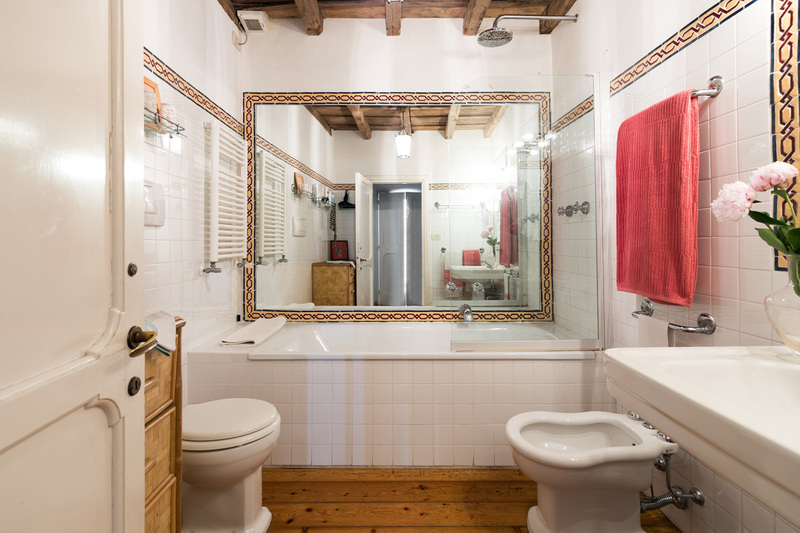 Finally, the newly renovated bathroom with a bathtub (and a hand held shower head), has a charming cabin feel to it. 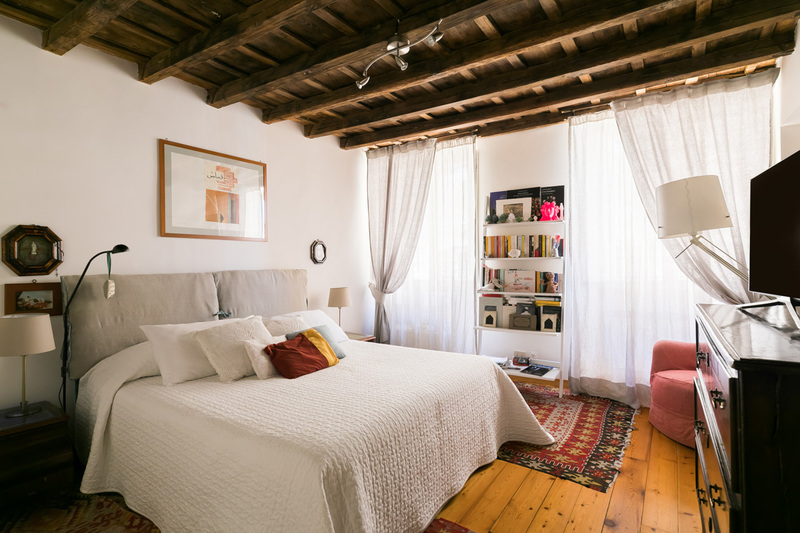 If you’re looking to be as centrally located as you can possibly be, all the while living with the comforts of your own home, look no further: this wonderful Farnese family apartment will make your stay an unforgettable one. 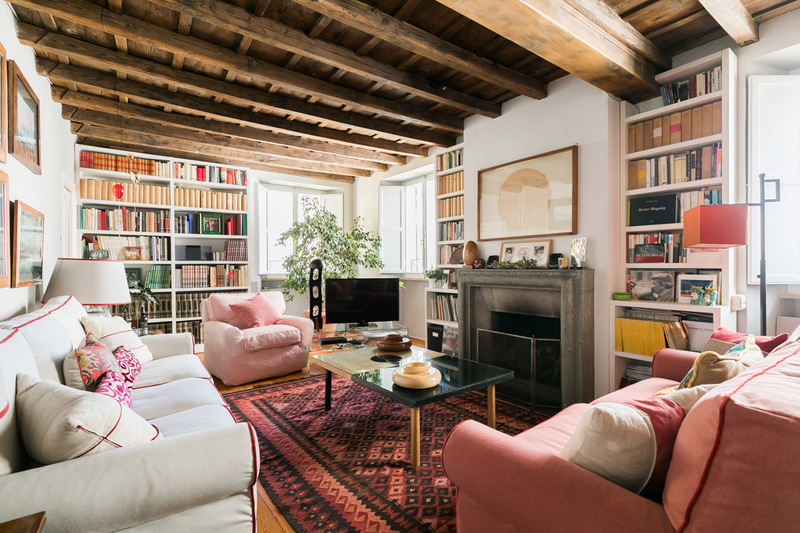 This apartment is just a stone’s throw away from Campo de Fiori. 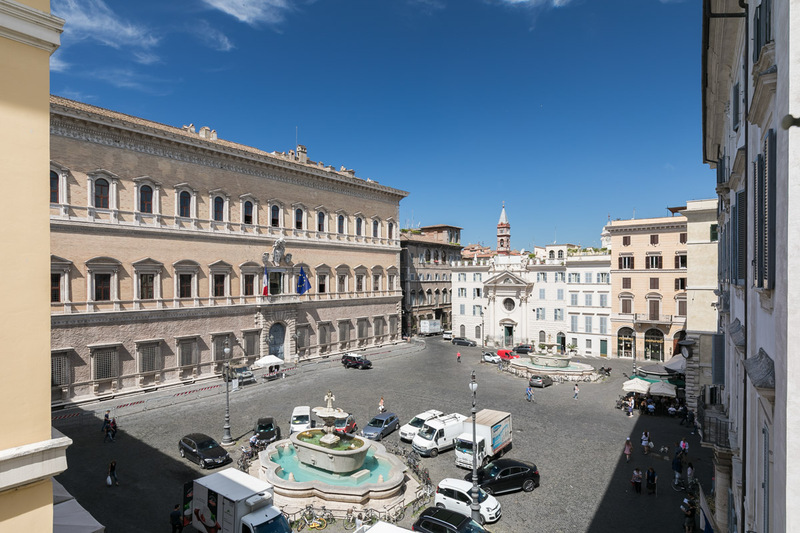 It is also less than a 200 meter walk to another delightful square: Piazza Navona. With this apartment, you couldn’t have chosen a more prime location. With the open air market of Campo de Fiori and the wonderful selection of authentic eateries, you are sure to satisfy your palate with all the foods you can get your hands on! Another great idea is to stock up at this market, and then cook up your own exquisite dishes in the comfort of your own home. From this property you will have easy access to all main attractions. Within minimal walking distance you will find the Pantheon and Trastevere. Just a little further away lie the Vatican City, Piazza Venezia, Trevi Fountain, Spanish Steps, and Piazza del Popolo. Why not take a midnight trip to the Trevi Fountain? This way you can avoid the crowds, as well as enjoy the illuminations. These light up the waters in a breathtaking way, making the already amazing fountain even more stunning! Your rental is also in a great location for facilities. There are plenty of banks, post offices, supermarkets, and pharmacies in the area. Moreover, at night it becomes a very lively neighborhood, as people gather in the many restaurants, bars, and piazzas. I have always stayed in hotels when traveling but this time I happened to find Rome loft and liked the look of the apartment. I have been to Rome before but this time it was extra special as I was taking my two grown up sons to see Rome with me for the first time. It was perfect and we all felt completely at home which made the short break, it ...Read Morewas a lovely place to come back to after a busy days sightseeing. To flop into the comfy sofas have a drink and relax. 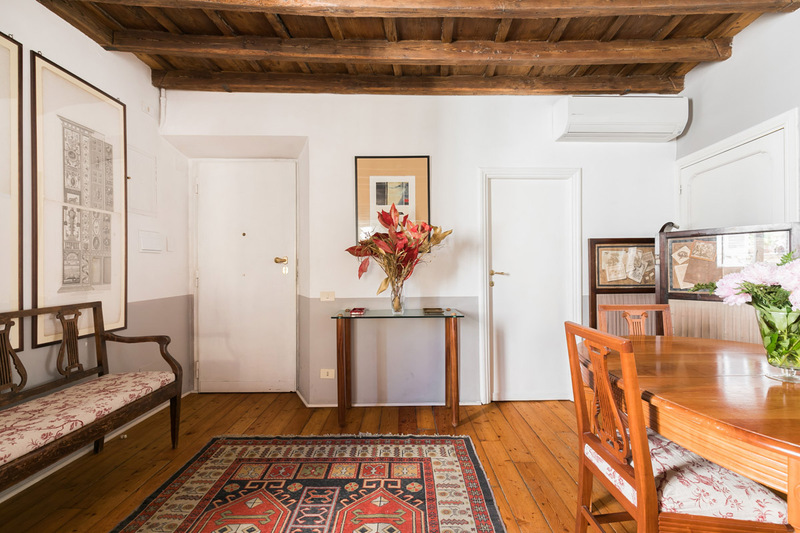 The apartment had everything we could possibly need a real home from home but so clean comfortable and beautifully positioned, just a step away from friendly restraints and the famous Piazza Navona just 10 mins by foot. I can’t recommend this apartment highly enough, it’s not fussy or glamorous but homely and comfortable and so very Italian. I will definitely be back with boys again in the near future for a very special weekend in beautiful Rome. Thank you Rome loft for a great break that we will remember. My daughter and I stayed at this apartment for a week in Rome -- and had a wonderful, authentic stay. We felt like locals. The apartment is small but it's charming, comfortable and the location is perfect. Our check-in was easy and everyone was incredibly accommodating to our earlier-than-expected arrival. The apartment was clean and comfo...Read Morertable after long days exploring Rome. The staff at RomeLoft was wonderful scheduling our arrival & departure transfers to the airport -- and very communicative when we needed them. I would stay here again, for sure! We are very happy to have rented Gea´s apartment. She is so nice and helpfull and so easy to deal with. The place is beautifully furnished, one feels at home. The location is really excelent! It´s the best part of Rome for me. The supermarket was only meters away and you had the fresh market in Campo di Fiori and plenty of places to eat or have a...Read More coffee. The only problem are the steps to arrive to the last floor, they are long and steep. I would´t recomend it to older people. Our stay was arranged on the very last minute as we were already in Rome. 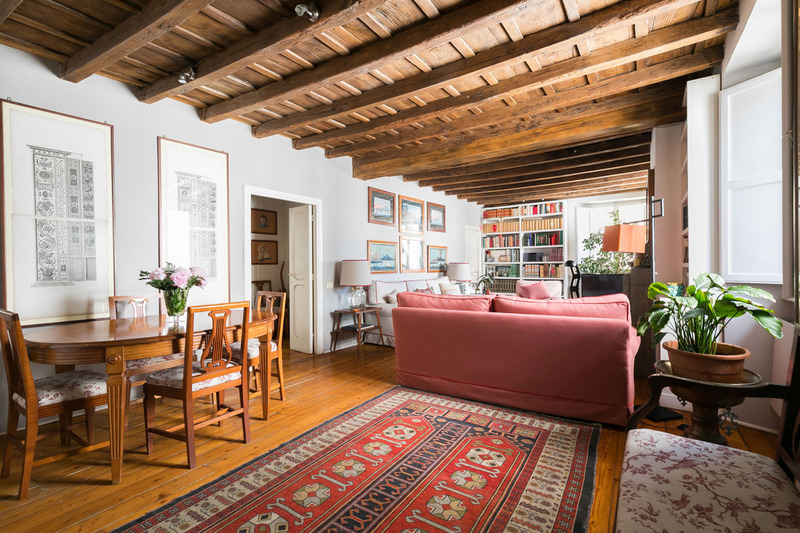 Rome Loft agency was pure professionalism and guided us perfectly, understanding our every needs. We finally chose this appartment and stayed for 10 days. It was perfect. Edurado, the owner, greeted us and showed us around. Some book with great tips to visit /eat/... Were ...Read Morereally helpfull. The appartment is chraming, full of soul. Each room is delicately decorated and clean of course. Kitchen was small but convinient as we do not really want to cook during hilidays. I would suggest more wine glasses (2only) and champagne glasses should be available, Rome is to be celebrated! Otherwise, the whole place was an absolute pleasure and we felt home from day one till the end. We will surely be back and book exclusively with Rome loft. We also had the great pleasure to meet their Driver Honey, excpetional service, you feel like a real VIP. It was our second experience with the agency amongst many others, it is so far the best one! Thank you very much for your service!